Publicis and Omnicom, two of the world's biggest advertising firms, have scrapped their planned merger. The merger, announced last year, would have created the world's biggest ad firm worth $35.1bn (￡22.8bn). The firms said they called off the deal as there were challenges that "remained to be overcome" and the slow pace of progress was creating uncertainty that would be "detrimental" to both of them. They agreed to terminate the proposed deal with no break-up fee. 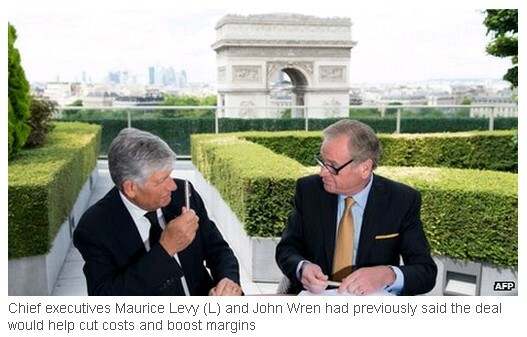 Last July, Omnicom's chief executive John Wren was pictured signing the deal on the roof of the Paris headquarters of Publicis with its CEO Maurice Levy. "The challenges that still remained to be overcome, in addition to the slow pace of progress, created a level of uncertainty detrimental to the interests of both groups and their employees, clients and shareholders," the two chief executives said in a joint statement released on Friday. "We have thus jointly decided to proceed along our independent paths," they said. The advertising industry has seen big changes is recent years and is now having to adapt to the growth of social media platforms such as Facebook. The proposed merger was expected to help the two firms respond to these changes. The firms had said that the deal would help them make savings of around $500m (￡325m) through pooling their resources, and also give them access to a wider range of clients. Some analysts had also suggested that they might be able to negotiate better contracts, not least because the merger would have made them the biggest operator in the sector. However, others had warned that the merger would create a conflict of interest between clients of the two companies - as they represented rival firms in many sectors. The two companies said they would continue to "remain competitors, but maintain a great respect for one another."